I grow zucchini every year and every year I have more than enough and end up freezing most of it. When frozen you can use zucchini all winter to make zucchini bread, add to cookies, or just cook and serve as a side dish. My family loves it. 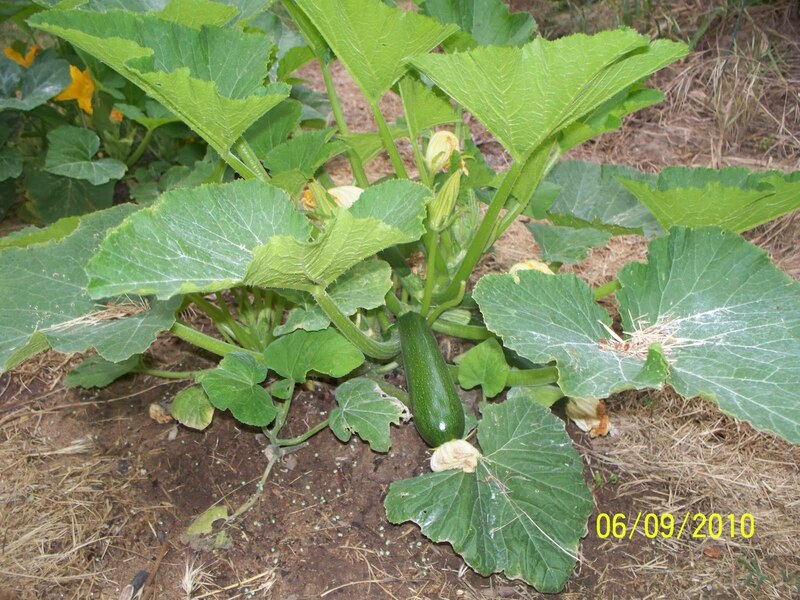 Zucchini is very low in Saturated Fat, Cholesterol and Sodium. It is also a good source of Thiamin, Riboflavin, Niacin, Vitamin B6 and Phosphorus, and a very good source of Dietary Fiber, Vitamin A, Vitamin C, Vitamin K, Folate, Magnesium, Potassium, Copper and Manganese. Recipe makes 2, 9″ loaf pans with 12 slices per loaf. 1 slice per serving. 1.) Preheat oven to 350 and grease pans. 2.) Using hand mixer on low, mix eggs, oil, applesauce, vanilla, lemon juice and sugars. Stir in zucchini. 3.) Add nutmeg, cinnamon, salt, baking powder, baking soda and flour. Mix just until blended. Do not over mix. Stir in blueberries. 4.) Bake for 60-75 minutes. Bread is done when toothpick inserted 2″ from edge of pan comes out clean. 5.) Cool in pan for 20 minutes. Cool completely on wire rack. Your zucchini looks great! Everyone here loves zucchini bread. I'm growing some and hope I get some out of it! I don't know what zucchini tastes like, but people sure rave about zucchini bread! Oh I love zuchini bread and I also put grated up zuchini in my meatloaf it's fantastic!! I am jealous you have so much! I am horrible about buying it and forgetting it is there until it's rotten..duhh!! I love zuchini. I had no idea it was such a pretty plant, too. Yum! Zucchini cooked on the grill is a favorite summertime side dish in our house! I like making zucchini chips. I slice them thinly, sprinkle lightly with seasoning (pizza,pepper, whatever herb you like) and dehydrate them. They are really good to snack on. I love zucchini, there's just so much that you can do with it. Zucchini is a great add-in to baked goods. Happy WW! I do not think my post posted.. I love zucchini it is one of my fav's.. Thanks for stopping by the other day and for linking up as well. Hope you're having a fantastic week! I love chocolate zucchini cake. You do get your money's worth when you plant a zucchini seed! I love zucchini. I didn't know you could freeze it. I always bake the zucchini into stuff and then freeze it. Good to know I can do it the other way around. First off, that recipe looks AMAZING! I'll have to try it. Both my MIL and my brother are getting tons of zucchini from their gardens, so I'll pass the recipe on to them too. You have to shred the zucchini first for it to freeze right, correct?? The recipe looks great, I would never have though to add Blueberries! Thanks for posting it! If you want to freeze your zucchini all you need to do is cut it up into small circles and place it in freezer bags. I'm not sure I've ever had this. Now I want to taste it. You do very well with your garden! Ohhh, we love Zucchini! My mom makes a rockin' Zucchini Bread. Now I'm going to have to ask her to make some today! Health is a huge hobby of mine and Currently reading the Schwarzbein Principle II… which will change your life and how you look at health. The recipe looks great– but I would sub agave nectar and pure maple syrup for the sweetner and not the refined sugars or chemical sugar replacement. They put too much stress on the kidneys, etc.Which causes insulin spike and weight gain etc. Zucchini bread is a fave! I never liked zucchini when I was younger, but I've just started to develop a taste for it. Especially delicious zucchini bread! Hopefully I will have a garden one day where I can grow my own veggies! That is a great looking zucchini. I love zucchini bread. Those look so much better than the supermarket variety! You should link up with our Thursday Raising awareness! !